Hello there! Another week has come and gone and it's time for a new Dynamic Duos challenge. 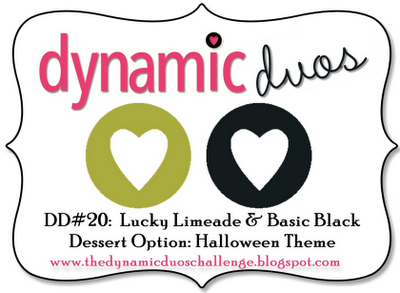 This week we are dressing things up with a "Black Tie"color combo of Basic Black and Lucky Limeade. The twist of this challenge is that you can also add some "dessert" to your creation by making a Halloween themed project. Spooktacular! 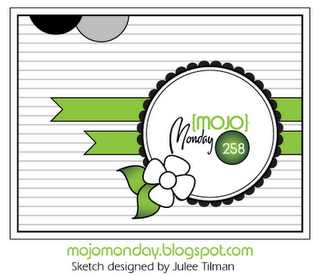 I used the awesome sketch over at Mojo Monday for my card layout. As soon as I saw it, I knew I wanted to give it a go! Hooray for banners! I have to admit, my mojo has been struggling lately. This one was kind of tough to get going and I'm not 100% sure I love the result. But I tried and that's what counts, right? I used the Frightening Feline stamp for the first time for this one. The image was heat embossed with Iridescent Ice Embossing Powder for some added pop. The main photo of the card is terrible, sorry...I will re-shoot it tomorrow. I have determined that, for me, the best way to get out of the "mojo rut" is to drag out the bling...so that is what I did. (Who am I kidding...I didn't "drag" out the bling. It is ALWAYS on my desk!) Might be a little excessive but honestly, can you ever have TOO much sparkle? It looks pretty cool in person, I promise! Please stop by and join us this week at Dynamic Duos! The rest of the Design Team have whipped up some awesome inspiration, too. Anne Marie this is so beautifully designed. Loving your creative style. Wishing you a fab weekend. I don't think your mojo's gone anywhere! I love this card! That chevron background is so cool and that cat stamp! Wow - I haven't seen it before! Awesome!!!! Hopefully I can play along with the challenge this week! Abby is just SO ADORABLE!!!!!!!! Love all the bling on here - and those great colors too! Very cute card. 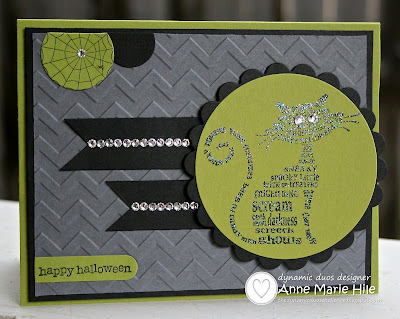 Fun halloween card - never too much bling. And the little kitty is adorable. Very fun Anne Marie, LOVE all of the bling. Mine isn't always on my desk but it's CLOSE by LOL! How cute is Abby!!??!! Still "fostering" or have you moved closer to adopting!! Your fline looks so glamorous embossed in iridescent ice! Love the added bling and embossed chevron background! Well Anne Marie - you asked. Instagram? Love. Your ADORABLE kitty? Love. Your fun Halloween card? Love. How's that for a perfect three. :-) Oh dear, gotta make it four - banners? Love! FUN card - I really like the bling you added as well. So sparkly and wonderful! Super cute! Love the theme and colors, great take on the sketch very clean and elegant! 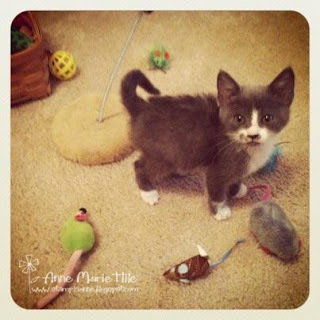 I love Instagram - and your adorable kitty - too! Doesn't look like you have been struggling with your mojo at all, love the chevron embossed background. Great card! Ack!! Anne Marie that cat is absolutely fantastic! I think that should be my first SU purchase! Love the embossed chevron background Anne Marie and all the lovely bling. Aww...Abby looks so sweet and happy! Your card kitty is quite spectacular too! Love the sparkle and those blinged up eyes!! You did a fantastic job with the colors! 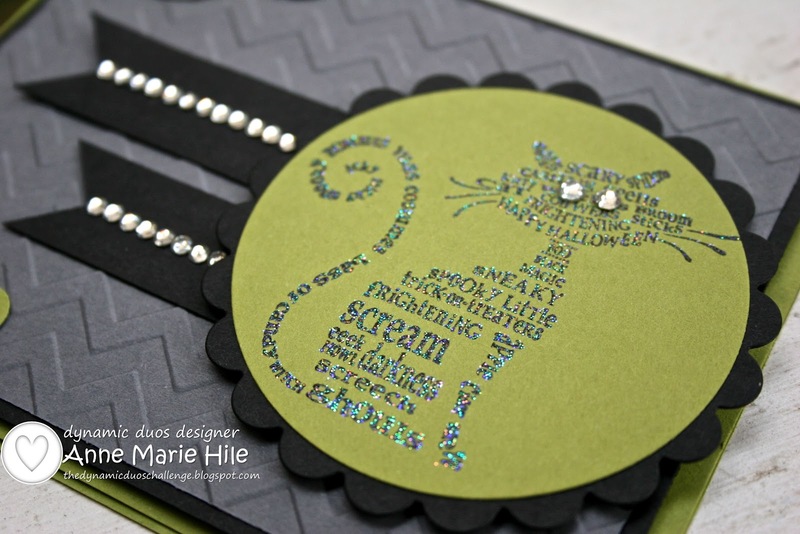 I just LOVE the kitty on your great card.....almost as much as the real kitty you have :) I love the grey color with the DD colors, and the embossing looks fantastic! Love your Frightening Feline, Anne, but I'm totally smitten by the kitten! What an adorable little ball of far! She's so tiny!